For many kids, a chemistry set is their first direct exposure to science and experimentation. It can also be a parent or educator’s first science-based interaction with a child. 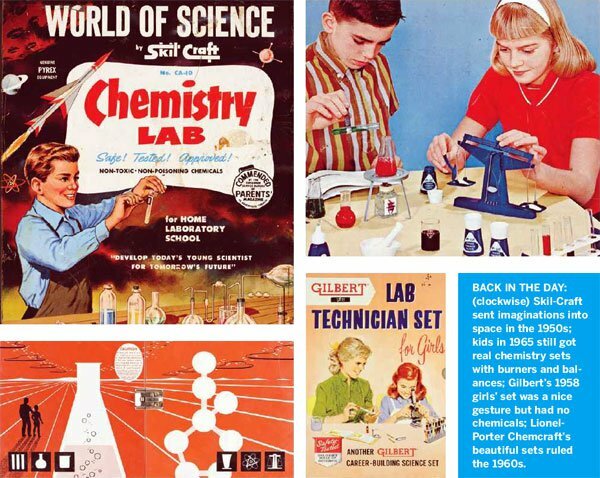 So in spite of the 1950s aura that surrounds chemistry sets in American culture, they can be an important part of a young person’s understanding and, more important, interest in science. That’s why the Gordon and Betty Moore Foundation’s competition to remake the chemistry set for the 21st Century is such a cool idea. The SPARK (Science Plan and Research Kit contest), a collaboration with Society for Science & the Public (SSP), is searching for entrants from far and wide, from elementary school teachers to scientists, engineers, and, of course, makers. The contest focuses on science beyond chemistry and seeks ideas for “new tools that tap into the spirit of the classic chemistry set and encourage children to wonder how and why the world works.” Submissions will be accepted until Jan. 7. The grand prize winner gets $50,000. Steve Davee, director of education and communications for the Maker Education Initiative, grew up with chemistry sets, but thinks they have become too watered down and need a good update. “They are getting dumber, more focused on demonstration rather than experimentation, and contain diminishing amounts of chemicals,” he said. “In some cases, there are no chemicals at all,” he said, pointing to this blog post by Sean Ragan. The power of a good chemistry set to awaken a child’s imagination is significant, he says. In my varied experience in preschool through high school education, kids go absolutely nuts over anything having to do with chemistry. It has that enticing level of ‘magic’ that is obtainable, understandable, but still so full of mystery. Chemistry helps shift a child’s mind toward imagining what they cannot see, a growth shift in understanding that there is an entire ‘secret’ world of things that happen that require investigation and clever methods to observe. It represents a whole new realm of curiosity, a new playground for ideas and exploration. Photography courtesy of Chemical Heritage Foundation (top left, bottom right); by Dustin Fenstermacher (top right, bottom left). SPARK is looking for participants to submit both working prototypes and ideas that entrants have not yet been developed. Here are a couple of sources to get you thinking about chemistry sets. MAKE projects editor Keith Hammond wrote this great ode to old school chemistry sets and tips for making your own. Robert Bruce Thompson literally wrote the book on making chemistry sets. And The Golden Book of Chemistry Experiments by Robert Brent and Harry Lazarus is a classic that still sparks creativity. What ideas do you have for reimagining the chemistry set?